Designed for all court types and matches, Falke Ergonomic Cushioned Short Tennis Socks help to protect players’ feet by absorbing pressure, impact and sudden shock, while assisting in maintaining your stability. 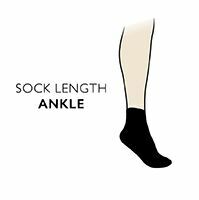 The socks are specially designed with sport-specific cushioning at the side ankles, Achilles tendon and ball of the foot) and for exact left and right fit. An anti-wrinkle crease-stop function prevents the socks from slipping inside tennis shoes and an air channelled design keeps feet fresher and drier by allowing the movement of air and dispersal of moisture.